Italcanna, a company that has over 50 years of experience in building carbon tubes, it also produces flag weavers rods. In fact, thanks to the help of expert flagweavers instructors, already in 1983 develop a rod with specific features of flex and weight. All current models are thus the result of this research and designed strictly and tested for the best performance, in terms of lightness and energy return to the top. The model with slub unlike the standard, has a more material on the basis that it increases the thickness. The length is always 175 cm. These models are ideal for inside balance weight. These types of rods are ideal for classical show and excellent replacement of the historic wooden rods. This model is ideal for the modern show. Can be balanced externally or internally. For its shape and rigidity favors the use in single flag-waver exercises and also small group. Result of the most recent technologies this rod has been developed and tested with caring attention to the smallest detail. Rod with high carbon content to accumulate more energy. This rod is ideal for all the kind of modern show. Can be balanced externally or internally. This rod for its rigidity is to be prefers with the use of exercises in great team or a number of bishops at least 10. CS-P1 Excellent product for the modern show, this given the characteristics of balance, shape and stiffness that can satisfy all needs. All these rods are equipped with safety pin, and screw-hole for plugs the TC25 dedicated terminal. A pocket bag is available as a dedicated transport sistem. S 6K Standard Flex rod 5,5 17,5 170 1750 . S 9K ” ” Stiff 6,5 18 240 1750 . R 6K Slub Flex 5,5 26,5 285 1750 . R 9K ” ” Stiff 6,5 27 360 1750 . CS CS model 6,8 18,8 273 1750 . CG ” ” CG - - - - . S9K-P1 Standard 9K + weight P1 6,5 26 745 1750 . R9K-P2 Slub type 9K + weight P2 6,5 26 nd 1750 . CS-P1 CS type + weight P1 6,8 26 775 - . BS Simple for children 5,5 15,5 125 1550 . BR Slub for children 5,5 25 220 1550 . BT-P3 Balanced for Children 6 25 505 1560 . GF 1 Special type GF1 15 20 nd 1800 . BL 3 Speciale type BL3 7,8 21 nd 1630 . These models are produced on request (minimum 20 pcs) and differ from the standard models for the measures as shown below. The construction material is the same basic. Pockets for rods transport made with very strong materials and reinforced at critical points. Rubber cap to be used as terminal, due to their rubbery and thick cushion effectively bumps on the ground. 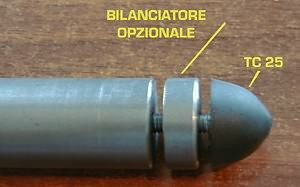 On request is available a balancer optional interposed before the cap that increases by 35 g the counterweight. 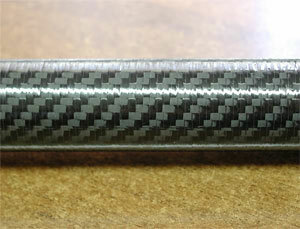 Carbon tube of 1.1 mt. suitable to achieving the brings flags, banners, etc.. The main advantage is that weighs about 3 times less than similar aluminum rod and unlike it, it does not oxidize and not keep nock shock. It can be left in natural color or brown color.